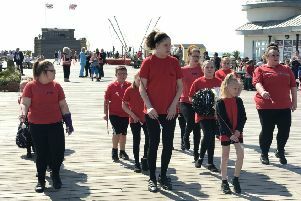 Hastings Morris dancers triumph in big competition. Three members of Hastings-based Mad Jack’s Morris won awards in the internationally renowned John Gasson jig competition, held in Sidmouth, Devon, as part of Sidmouth Folk Week, on Sunday August 5. A jig is a dance performed by just one or two Morris dancers. Competitors came from across the UK, America, and Japan. Chris Rudd won the prize for the best jig by a dancer aged over 40, and also came second in the ‘double jig’ - a dance performed by two dancers. Rhys Boorman won the prize for the best jig in the competition, effectively the ‘best in show’, with the music played by Bryony Leech, who is the fiddle player for Mad Jack’s Morris. The skill of the musician is taken into account when judging the competition, so credit for coming first goes both to Rhys and Bryony.